I participated in the Arkansas State Music Teachers Association (ASMTA) regional festival again this spring. I had four students enrolled, the same as last year. Two of those were continuing students; two were new students. This event was held on Saturday, April 6th, in the music building at the University of Arkansas in Fayetteville. I didn’t sleep well and woke up before 6 a.m. since I was petrified by the possibility that I could oversleep. I was scheduled to do musicianship testing, which took the entire morning after my 8 a.m. arrival. I was able to get pictures of 3 out of my 4 students. That’s because I insisted they stop by my testing room before they left. All of them received a Superior rating of 1, but one did better than that by securing a 1+ as the first alternate to the winner for her level. My studio did a lot better this year in supplemental testing as well, with several certificates awarded for scores of 90 or better in musicianship and written theory. It is always interesting to compare notes with teachers in the break room during lunch. We discussed the surprises and disappointments of the day, and traded stories about what else is going on in our lives, musical or otherwise. As you can imagine, this event only happens due to the hard work of several volunteers over weeks and months before the event; my helping out on the day of the event doesn’t compare to that! My thanks to them! I wasn’t looking to buy a piano. Really! But I bought a piano anyway. 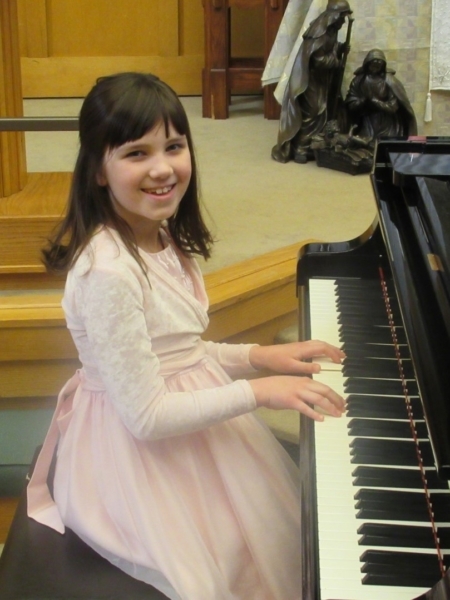 The interest was sparked by a piano parent who was searching for an acoustic piano. But I was surprised when she emailed me an advertisement for a 48-inch Yamaha U1 upright, built in 1977. This is a top-of-the-line upright, which Yamaha continues to make in Japan, along with their tallest model, the 52-inch U3. They offshored production of all of their shorter uprights decades ago. When it was clear that my piano parent was pursuing pianos in a much lower price range, I made the call. It’s tough to fairly evaluate resale prices for used instruments, but I knew that the asking price was correct if the instrument was in excellent condition. However, even well-loved instruments can develop issues requiring significant rework, so I didn’t want to take any chances. I hired my preferred tuner to do an analysis of the instrument, since a $60 fee was well worth saving hundreds or even more if I chose poorly. I have to be realistic that this might be the last instrument that I purchase. Yes, I’d still love to have a Steinway B or Mason & Hamlin BB, but this is a practical decision for now. Everything worked out, and I was able to find a new owner for my Knabe spinet that is old enough to have ivory key covers. It was a gift to me, so it is now a gift to a new piano parent. I never loved this piano, but that’s more a reflection on me than it; I have better instruments available to practice where I work. It still has more to give, and I hope it will be appreciated for years to come. Adopt a new-to-you upright of your choice. You won’t be disappointed! Author Broc HitePosted on 2019-04-17 2019-04-17 Categories PianistTags goal, listen, piano, practiceLeave a comment on I bought a piano! I received very different kind of feedback after performing a new piece in my repertoire, the Chopin Scherzo No. 2: “I am glad that you learned that for yourself and that you shaered it with us!” It’s not the typical response following a performance. I knew that the comment was well intended, coming from one of my favorite people at First Methodist of Bella Vista. Still, it took a while to sink in what that actually meant. 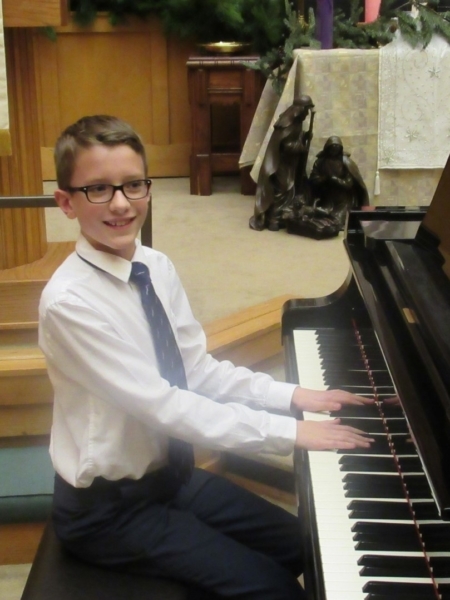 While my reasons for wanting to learn new repertoire on the piano and organ are multi-faceted, it’s clear that they are all related to my goal to become better at both. I encourage my students to set and achieve goals, in a way that’s appropriate for their age. If I find a child is shirking responsibility, I try to address his responsibility in the process. One of the many benefits of piano lessons is becoming responsible for one’s work. The piano is just the tool that allows that to happen. Performance is the natural culmination of music study. If you’ve taken the time to learn a piece, you should share it with others. Recitals and music festivals are the formal way to do this, but there should be other ways too. Performing for family, church, school, or a retirement community are equally valid. Live performance gives you feedback that you can’t get in any other way. Plus, it helps focus and refine your work, since there is a fixed date on the calendar that will make you accountable! Learning and performing go hand in hand for me. I couldn’t imagine learning and then not performing. I have had some students, particularly adults, who have no interest whatsoever in public performance. That’s okay too. What doesn’t work well is performing without learning. Yes, I have performed more times than I’d like to admit without being sufficiently prepared. Building an audience is difficult, and it’s important to do your best. I’m grateful to have the chance to learn new pieces, polish old ones, and share them with my audiences and inspire a new generation of musicians. I was practicing after teaching this week, something I do whenever I have the chance. When learning new pieces, I sometimes find it difficult to get started. Once I get started, it’s sometimes difficult to keep making progress. Such was the case in trying to get through the entire Chopin Scherzo No. 2. It’s a new piece for me, with 780 measures over 23 pages that I’ll perform as a church postlude on February 10th. It was really tempting to just practice the portions that I already knew, versus getting further into the piece as I must. One of the techniques I use is to mark the date at the furthest point that I have practiced. Then, I use that endpoint as a starting point for the next practice session. What was frustrating this particular evening was that I really needed to move forward quite a bit to stay on my timeline. And I was having a hard time doing it. That’s when it dawned on me…was this fear or laziness? Or a combination of both? My particular challenge is one that I set for myself. I decided a while ago to commit to learning lots of difficult new music on both the piano and organ. Even if I’m the only one who knows I didn’t do my best, it bothers me. I’m in good shape right now on that piece, and on the other pieces that are upcoming. But that will only remain true if I keep remembering to battle these two foes, fear and laziness, by continuing to push forward each time I practice! Author Broc HitePosted on 2019-01-31 2019-01-31 Categories PianistTags performance, piano, practiceLeave a comment on Fear or Laziness? I got the chance to do quite a bit of reading during time off from work, especially following Christmas Eve, which included two services and a very difficult organ recital in between those broadcast via Facebook Live. Without looking for it, I stumbled upon an opinion piece in the New York Times titled I’ll Never Be Rachmaninoff. It was written by an adult piano student who returned to the piano following a long absence. Her goal was clear; but what is your goal? It’s not the first time I’ve written a post based on the recreational benefits of piano study, but I think it always comes across better in the first person. Jennifer Weiner tells the story of finding teachers, and how study positively affected her life and daughter as well. 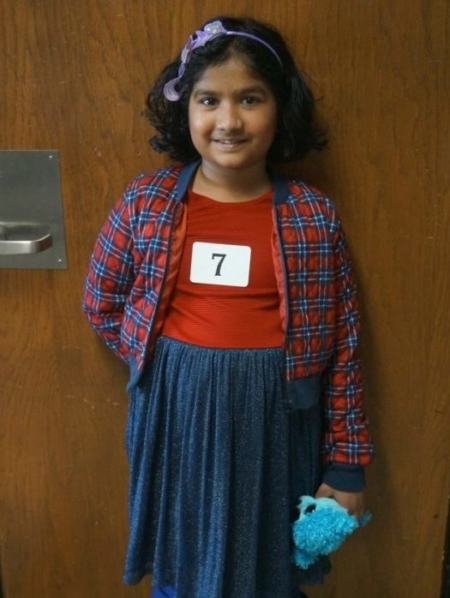 Ms. Weiner was a very competitive person in youth and in life, so the last thing she needed was to resume piano study with the hopes of becoming great. Her goal was to be good, not great, and she describes her journey towards just that. Thus, the title of her article is particularly compelling. I try to remember to ask my students about their goals and to regularly check in with them that lessons are meeting them. Often, especially with younger students, the goal is pretty general, just to play better, and the means to get there isn’t specific. For other students, particularly teens and adults, there are more specific goals in mind. It might be to reach higher levels in classical study, to play pop songs, or to play Christmas carols for their family. One of my adult students had that last goal. She just reported back that it went well. For this particular student, the focus was short-term, to play a series of Christmas carols well enough for a sing-along. She enjoyed it enough and received enough positive feedback that she’s considering more study, though not right away. That’s great! Whatever your goal is in piano study, I hope to help guide you there. Whether your goal is to be good or great, I think Sergei would approve! Author Broc HitePosted on 2019-01-02 2019-01-01 Categories Pianist, Piano Teacher, ThoughtTags advice, listen, pianoLeave a comment on What is your goal? I’m often asked my advice about what piano someone should get. However, my advice is not often followed, since I’m providing an answer from a lifetime of musicianship and not one supporting a desire to save money or buy a so-called maintenance-free instrument. So how could I possibly make more of a dent, to get someone to try to think differently? Listen to the piano. Since I perform quite a bit, I play a variety of instruments. Most of them are acoustic instruments, but there are occasions when they are not. I played for a birthday party earlier this year where I was provided with a very short 61-key electronic keyboard, without damper pedal. I’ve also had the chance to play some really good keyboards, such as a Yamaha Clavinova. Just for the record – for those of you who refuse to even consider an acoustic instrument – please consider this model. If taken care of, it will provide you many years of enjoyment, and have resale value if/when you no longer want it. However, I can’t say that I’ve ever played any keyboard without thinking it’s a compromise. I’m not talking about this from a purist or snobbish viewpoint, though I certainly could do so. Listen to the piano. How does it sound? To me, there’s only way to produce the sound that a piano should have, and that’s with a hammer hitting a string. Yes, I get that sampling has improved greatly during my lifetime to where electronic instruments merit their place. But they just aren’t real! Listen to the piano. I was scrolling through Instagram posts one morning, and came across a pianist whom I know only through an interview on a subscription site to which I belong. She often posts students playing her old American-made grand piano that has a sound that could only come from that instrument. Between the moving parts of hammers and strings and the fixed ones like the iron and wood, each piano has a story to tell, if you just listen. I’m still amazed that my tiny Knabe spinet, so old that it has ivory key covers, speaks so beautifully. There are compromises made when building such tiny pianos, but they can still sing and inspire. So that’s how I’m going to start when I’m next asked this question. Perhaps my advice will go unheeded. But maybe he will listen to the piano. And who knows? That might make all the difference! Four of my students from the Shepherd Music School participated in the year-end recitals. 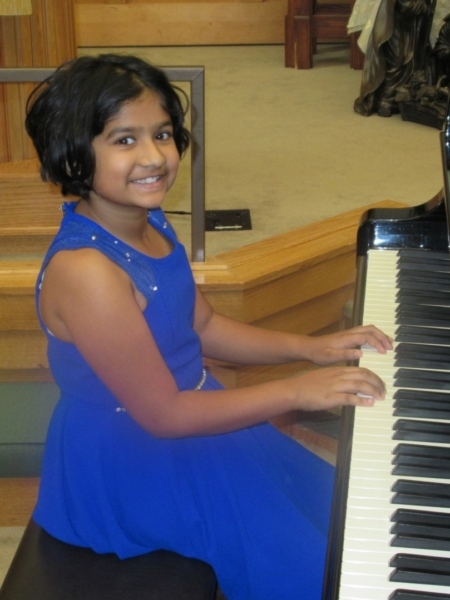 Two made their recital debut; the other two are becoming old pros performing in public. 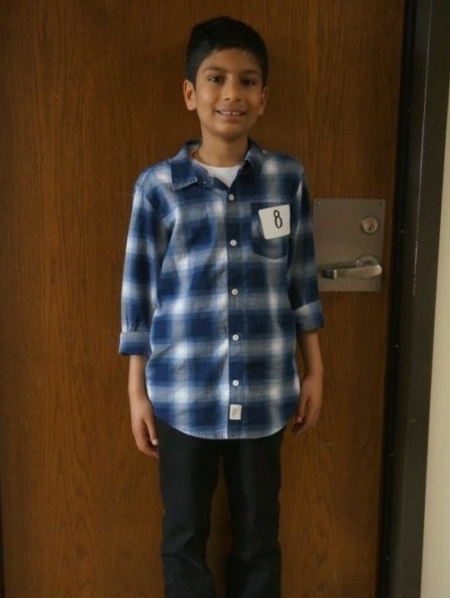 Since all of the parents have given me consent to post their children’s photos, I have included them in the photo carousel below. I’m really proud of them all, and am excited to hear how they grow over the coming semester. All of my students have plenty of chances to perform publicly. In this past semester, we had a Halloween performance party and played for the residents at a local retirement community. 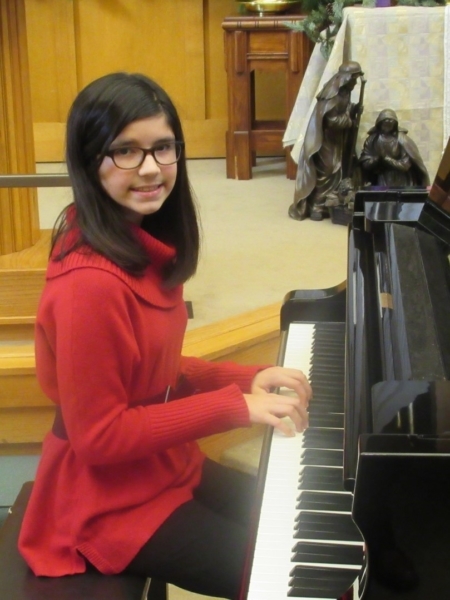 For those participating in the Sonatina Festival, there was a warm-up recital in Springdale prior to the event itself. My private students do miss out on the school recitals, but we often have in-home recitals instead. It’s a more intimate chance to perform for their family and friends. Here’s to continued success in 2019! I had a wonderful run recently as the substitute pianist for the Bella Vista Women’s Chorus (BVWC). My performance agreement included two rehearsals and three concerts with the group, but ended with the final concert this past Tuesday. I had high hopes as I arrived at the venue, since the first two concerts were really successful. The lobby and grand parlor were beautifully appointed, and a very shiny baby grand piano awaited me. However, during the choral warmup, I learned that this concert was not going to be the success for which I hoped. There were five to six notes that were sticking, including the A4. This is a pitch in the center of the piano known as the tuning pitch used by orchestras. When several of your pieces are written in D Major and F Major, it’s impossible to avoid this note, since it’s part of the tonic chord! The problem was that if I transposed pieces, I ran into other notes that were broken. For instance, there were two sticking notes in the bass, a B-flat and E-flat in the bass, so in avoiding one problem I encountered another. To someone who doesn’t play the piano professionally, this may seem like a minor deal. Perhaps this piano would have been a treasure compared to the ones used by the Jewish musicians who were trying to make music to keep their sanity in Theresienstadt. But this is an upscale retirement community, not Nazi-occupied Eastern Europe, which purports to care about their residents by providing the means for groups like the BVWC to bring the joy of music that we all need. Some of the residents I talked to between the warmup and the concert asked me how I was dealing with the problem of the broken keys. I said not very well! They were fellow pianists who had mentioned the problems to the staff many times over the past several years without any success. It was clear to me, even without their confirmation, that the piano had not been maintained for years. I noticed that the instrument was also wickedly out of tune. Pianos do go out of tune mildly due to seasonal changes in the temperature, humidity, and atmospheric pressure. This was instead pure neglect. While playing in the concert itself, I frequently lost my place in complicated repeating passages as I scanned ahead on the page for the A4. I was trying to avoid playing that note so as not to injure my hand. I chose to play in octaves low and high trying to avoid the broken notes. As a performing musician, I don’t make a lot of money, especially when working with all-volunteer groups. When the opportunity to make music is taken away from me, there is nothing left. Lesson learned. I will insist that the concert organizer confirms that the performance instrument is completely operational. Simply put, all 88 notes play correctly. It’s a welcome bonus if the piano has been tuned recently, but sometime in the last year is the minimum standard. As a backstop, I will be adding a clause to my standard performance agreement: If a piano is not completely operational, I am free and clear to walk out of a performance and still receive the performance fee. One Facebook share. Most of you have probably shared something on Facebook. Marketers encourage us to do this all the time since they understand the power of multiplication. 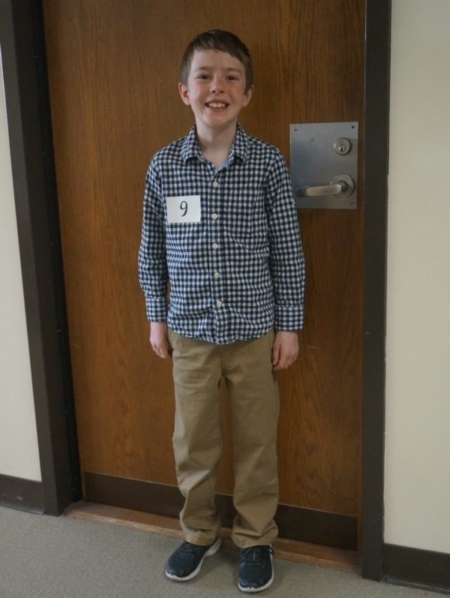 I expect that maybe a dozen of my followers might see the photos I post of my students, typically from their performances at festivals or recitals. A few people may even like the photos. So what was different in this case? One Facebook share! One of my piano parents, who apparently has a very large friends list, decided to share the post including her daughter. It blew up – in a good way. The stats are attached at the bottom. This post was seen by 418 times, and of those 25 liked it, and 6 commented on it. Just from one share! I wrote a post this summer called Small Action Big Impact, of which this could be a part two! Though in that case, I was talking about a review on a Website, which was viewed by more people than I could have imagined. The principle is the same. So at this time of Thanksgiving, I’m reminded to make the effort to be ever thankful, whether that’s expressed in a smile, a kind word, or even a note of encouragement or thanks. It also makes me redouble my effort not to hurt anyone through an unkind word due my impatience or judgment. You never really know what impact either may have.